The Women's Padded Luna cycling short is the go-to short for ladies who want to mix style, comfort and innovation. The Luna Bike Short is designed to be your go to short for your longer rides. Our innovative side pockets can hold any accessory or cell phone that you may want to carry on the ride. We used a lightweight mesh fabric for the pocket that will keep you cool. 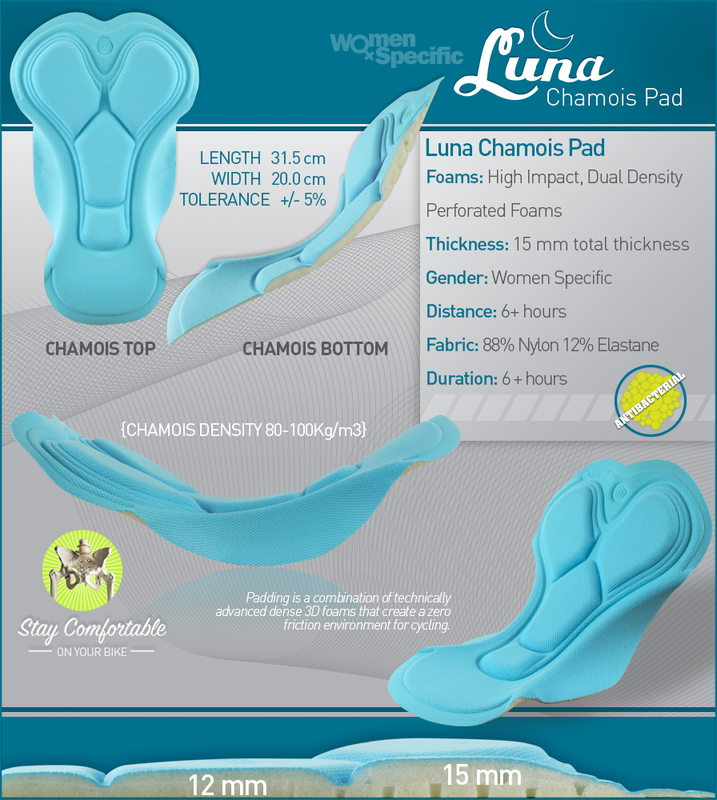 The Luna Chamois Pad is 15mm thick at the sit-bones, and is made up from a high impact, dual density foam. The backside of this chamois pad is perforated to ensure maximum breath-ability. Ordered a pair of these, and LOVE them! The padding is great, kept me comfortable on a 30-40 mile ride. The side pockets hold whatever you place in them securely, and the items don't move around or slip. The leg grippers keep the legs in place. These are excellent shorts. These are the worst bike shorts I have ever purchased. They caused my bottom to feel likes it was burning. I had to hurry home and get them off my bottom. Ouch!!! Be careful, if you wear the shorts to try them you can't return them. Then you are stuck with shorts you can't wear. These are my new favorite shorts. The chamois is the best I've ridden on so far: it's thin but dense, never gets in the way, and has allowed me to finish my rides in no discomfort whatever (I ride 15-40 miles per ride, am 54 years old, and weigh...too much). I like the leg grippers (I have chubby thighs, and the other popular style, with the wide elastic strip, just makes me look sausage-like). The waist hits me in a comfortable position, and I never find my self wanting to adjust anything. These shorts are just great. I'm ordering another pair.